29LT Zarid Sans type family consists of 16 styles: 8 Standard styles and 8 Slanted styles, covering the following weights: Thin, Extra Light, Light, Regular, Medium, Semi Bold, Bold and Black. Zarid Sans is the stark version of Zarid Serif. While Zarid Serif is categorized as a formal, confident and robust typeface, Zarid Sans is the friendly, direct and clean contemporary relative. The Arabic Naskh Mastari becomes Neo Naskh, whilst the Latin wedged serif becomes a sans serif. The two distinct scripts agreeably coexist in look and feel while each one of them retains its’ own structure and characteristics. The Arabic script in the type family is designed by Pascal Zoghbi while the Latin script is designed by Jan Fromm. The typeface includes advanced typographic features (ligatures, alternates and stylistic sets) that improve legibility and give diverse typesetting options. The fonts cover all Middle Eastern, North African, Eastern European, Central European, Western European, and North and South American Languages. The number of glyphs per font is 1550+. 29LT Zarid Sans is fresh, it compromises clean outlines that stem from calligraphic structures and rendered in a humanistic aspect. The equilibrium between the main body structure of the letters and their corresponding ascenders and descenders is carefully studied to give the typeface a contemporary composition without affecting legibly. In the Arabic script, the medial structures of the letterforms (heads, eyes, ears, almonds, etc.) are opened-up while kept in proportions with the upper and lower parts of the outlines (bowls, bellies, tails, arms, legs, etc.). The design drifts away from the traditional calligraphic Naskh proportions while keeping the letterforms well-structured and composed. It respects and inspires from the Arabic calligraphic writing systems while drawn with modern features and graphical qualities. It is a Neo Naskh typeface designed and tested to be legible in content text in print and screen mediums. Additionally, its unique characteristics and design details make it suitable for display text. In the Latin script, the letterforms are built with moderate open x-height and relatively long ascenders and descenders in comparison to other sans serifs. It is a humanist sans serif typeface with a neutral design approach while keeping some calligraphic aspects in the outlines. It has open forms that lead the eye horizontally, making it suitable for long reading and small text. It has roots in calligraphy and evokes a feeling of warmth and personality, in contrast to other geometric and neo-grotesque sans serif fonts, which can feel cold and sterile. The humanist approach makes Zarid Sans pair well with Zarid Serif, which in its term is a humanist serif typeface. Both the Arabic and Latin are designed to be clear and legible in small sizes, but this doesn’t remove the fact that they look elegant and unique when used in large display type. This makes the type family suitable for a vast array of design applications such as literature and educational publications besides branding and design projects. Likewise, the diverse weights present in the type family gives graphic designers endless options of visual hierarchies, while the slanted styles add typographic highlight or emphasis. The letters in the standard styles are drawn in low pen stroke contrast structure that is coupled with even curved baseline connections and clean terminals giving the typeface its friendly and corporate attitude. In the Arabic, the Neo Naskh baseline is uniform while still holding some sharp cuts and angles from its Naskh Mastari sibling that shows in the Arabic letters “seen”, “sheen”, and “meem”. Likewise, in the Latin, the typographic links between the stems and the bowls and shoulders recall the calligraphic sharp cut from its serif relative that shows in the letters a, b, d, h, m, n, p, q, r, and u. The letterforms are inspired by calligraphic makeup but drawn with a modern-day impression. The Arabic ligatures and elongated stylistic sets give the fonts a unique calligraphic touch and make the typeface friendlier to the classical Arabic reader. The design approach, with open counters, clean terminals/finials, balanced weight, and low contrast, are all elements that bring the Arabic and Latin scripts together. Unsurprisingly, both scripts were created in synergy and were inspired by each other simultaneously. While Arabic typefaces have a strong horizontal structure because of baseline letter connections, Latin typefaces have a vertical rhythm because of an upright stem structure present in most glyphs. The balance between the Arabic baseline thickness and the stems width in the Latin letters makes bilingual text color perfectly even and gives bi-script typesetting layouts a harmonious texture. Zarid Sans is the second inline family member within the 29LT Zarid superfamily ongoing development. The Arabic was designed based on the experience gained by Pascal Zoghbi’s involvement in the design of low contrast Arabic bespoke and retail fonts since 2006. Design lessons were learned from successful and flopped type design approaches Zoghbi explored. Some fonts were seen as interesting and successful when designed, but later lost charm or proved poorly legible in certain typographic treatments. While other fonts were more successful and retained proper legibility alongside a modern design feel and approach. The balance between Arabic calligraphic structures and contemporarily designed letterforms is always a struggle and the borderline of legibility is continuously tested. Zarid Serif is a combination of a Naskh Mastari Arabic accompanied by a wedged serif Latin counterpart, while Zarid Sans is a combination of a Neo Naskh Arabic accompanied by a sans serif Latin. The creation of the Neo Naskh version of a Naskh Mastari Arabic requires the revisit of all of the glyphs’ outlines and amend the letterforms structure meticulously. While in the Latin glyphs the serifs are removed, finials and terminals adjusted, typographic contrast lowered, and spacing adjusted; in Arabic, it is a question of removing all the strong calligraphic aspects from the Naskh Mastari fonts, eliminating most of the sharp cuts and edges, changing the baseline connections, redrawing the finials and terminals, and adjusting the spacing. The alteration of the Arabic letters’ contrast and removal and calligraphic pen structure comes with the overall change of the letters’ structures. Jan Fromm tackled the design of the Latin counterpart. The visual connection between both the Latin serif and the Arabic glyphs was of primary importance. The goal was to expand the Zarid type family in a way that all the family members get along with each other and work seamlessly together. Zarid Serif Latin is clean and precisely drawn, has a robust yet dynamic character, but is humanistic inherently. Fromm preserved these attributes and adapt them to a contemporary sans Latin. He created sloped stems, ascenders, and descenders to remind of the handwritten structure that Zarid derives from; drew sharp cuts between bowls and shoulders that lend the glyphs personality and insinuate the cuts in the serif companion. As in Zarid Serif Latin, the ascenders and descenders are relatively long, which adds seriousness and a pinch of elegance to the typeface. This gives the Latin a counterparty aspect while being derived from traditional proportions. As it should be for a modern-day Latin sans, the letters contrast was lowered giving the typeface a rounded feel and formal appearance. The diamond-shaped tittle (the typographic name for the dot in a Latin glyph such as in the i and j) was changed to an elliptical-shape in the Latin while the diacritic dots in the Arabic where kept rhombic. This design decision was taken after Fromm and Zoghbi did several tests of diamond and elliptical dots in both scripts and analyzed the overall appearance and presence of the developing sans. The change of the diacritic dots from rhombic to elliptical in the Arabic removed all the formality and seriousness of the script and made it look juvenile and childish. In the Latin, the presence of the diamond tittles made the typography too noticeable and unlinked to a sans spirit. Hence, Fromm equipped the Latin characters with elliptical tittles, making it more consistent and less eccentric, while Zoghbi kept the rhombic dots in the Arabic, keeping its gravity and correctness. 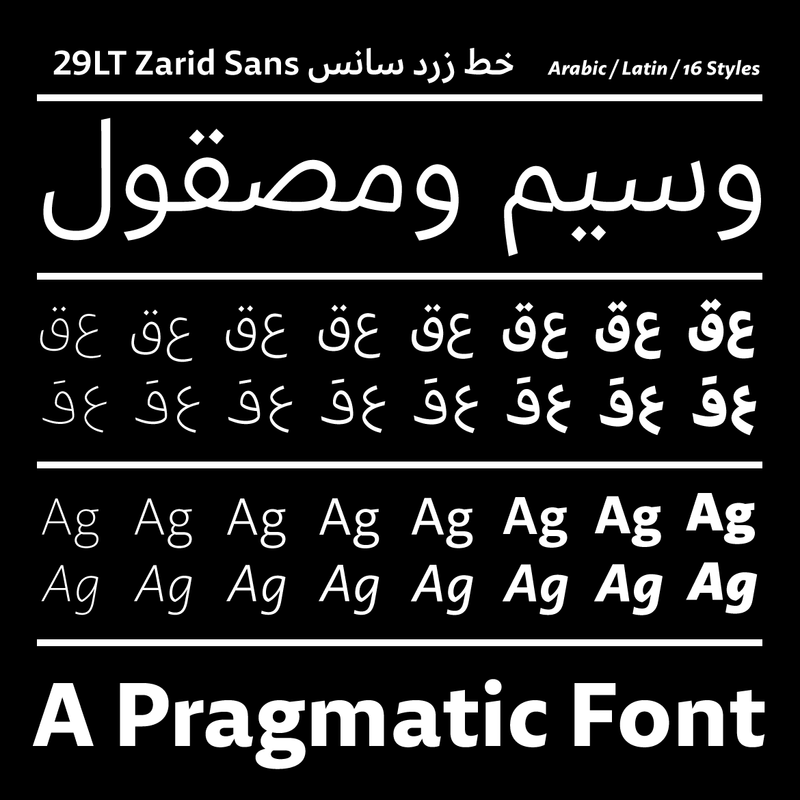 During the work on Zarid Sans, both Zoghbi and Fromm continuously compared the serif with the sans styles, set Latin text next to Arabic text and vice versa. They took special care in equalizing the proportion, weight, and letter spacing throughout the different scripts, to gain a consistent and harmonious result. ill. 5: Some glyphs had an outline adjustment or a complete change. With the development and growth of 29LT Zarid type family, additional multilingual Arabic and Latin typesetting flexibility are offered. The type family becomes a design tool for graphic designers to explore endless typographic possibilities and explore different communication complexities in their projects. The type family becomes an important contribution to the growing graphic culture in the MENA region. A typographic hierarchy can be addressed and explored creatively. The mix and match of diverse weights from both the serif and sans serif styles offer endless typesetting options and variations in professional design projects. It is traditionally considered that serif fonts are more legible than sans serif fonts, but is it always the case? What about a high contrast calligraphic Arabic fonts in comparison to a low contrast humanistic Arabic font? If we classify serif and calligraphic fonts as formal and sans serif and humanistic fonts as informal, it would directly entitle that the first would be suitable for copy text while the second appropriate for display. In reality, it all depends on the usage of the fonts and typographic skills of the graphic designer or typesetter. How the text is set, in which point size, in loose or tight leading, in long or short columns width, etcetera. Correspondingly, different mediums require different typographic options. What is contemporary and legible in print versus screen applications? In print, shall the sans be used as a display type and the serif as text type; while on screen, the serif becomes a display type and the sans used for content since it is more robust and legible in screen resolutions?